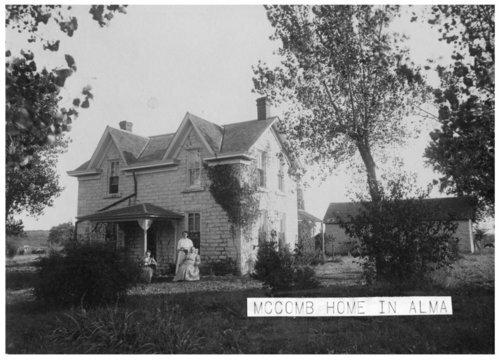 Three unidentified women are seen in front of the McComb home, located at the southeast corner of 4th and Illinois Streets in Alma, Kansas. On the reverse of the photo is written: "by an old Swiss stone cutter 6 rooms with a summer kitchen on east side. The old stone barn was used to store ice until El. Light plant was built. There was a large cellar and a fine well 60 feet deep."